The first half of the Superstar Shakeup brought some big names to RAW, so now we will wait and see where their new paths will take them. 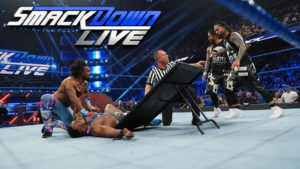 Breeze vs Strong, SAnitY vs Undisputed Era, Harper vs Dijakovic, and Ohno vs English make for an entertaining night of action. The Street Profits take on Aichner & Barthel, Candice LeRae tries to shut the mouth of Aliyah, and Danny Burch attempts to stop Jaxson Ryker in a pretty good episode of NXT that served mostly as a recap of Takeover: New York. Toni Storm defends her Women’s Title against Jinny, Piper Niven makes her NXT UK in-ring debut, and Travis Banks battles Kassius Ohno in a very good episode of NXT UK. Tony Nese puts his newly won Cruiserweight Title on the line in a rematch against Buddy Murphy, and Drew Gulak has Jack Gallagher attempt to teach Humberto Carrillo about grappling in a good episode of 205 Live. 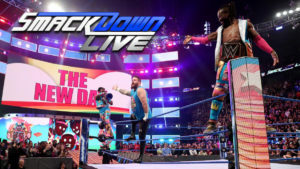 New Day faces The Bar and a new friend, Black, Ricochet, and Ali face Andrade, Rusev, and Nakamura, The IIconics prove they are fighting champs, and The Usos put their titles on the line against the Hardy Boyz in a good episode of SmackDown Live. The RAW after Wrestlemania was an entertaining show with a few small surprises and some high-energy matches. Kairi Sane and Bianca Belair battle in the main event to build some momentum in the final NXT before Takeover: New York. Trent Seven tests himself against Joe Coffey, Kay Lee Ray fights Isla Dawn, and the team of Williams and Jordan attempt to take down Aichner and Barthel in a very good episode of NXT UK. Akira Tozawa looks to get a win back on Mike Kanellis, Oney Lorcan battles Kalisto, and Buddy Murphy tries to set a tone for his title defense this Sunday in a good episode of 205 Live. 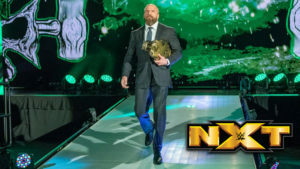 Adam Cole confronts Johnny Gargano, Shayna Baszler makes another statement in the women’s division, Matt Riddle warms up for his North American Title match by taking on Kona Reeves, and this year’s Dusty Classic winners are decided in a good episode of NXT. Mark Andrews and Noam Dar have a great match with an unfortunate ending on an episode of NXT UK that also features Ripley versus Brookside, Devlin versus Maloney, Ohno explaining his actions, the debut of Piper Niven, and the contract signing between Walter and Pete Dunne. Cedric Alexander looks to bounce back in a match against the rising Ariya Daivari, and Lucha House Party takes on Gulak, Gallagher, and Carrillo in a pretty good episode of 205 Live. 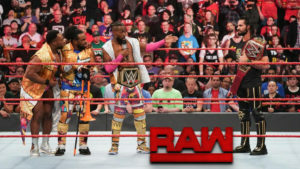 Big E anad Xavier Woods fight for Kofi as they run a tag team gauntlet to send Kofi to Wrestlemania, Asuka has to put her title on the line with no explanation, The Miz wants to add a stipulation to his match with Shane McMahon, and Kurt Angle wants to face AJ Styles during his farewell tour. 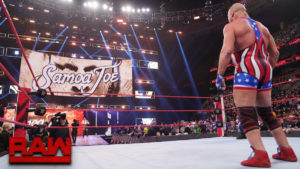 RAW coasts towards Wrestlemania with a show that added very little to any of the ongoing story lines, but a show that did have a few nice moments. James Drake and Tyler Bate battle in a good main event in an episode that also featured the NXT UK debut of Kassius Ohno, The Hunt taking on Stoker and Howley, and Dennis grounding Ligero.